This is one of the best reasons ever to walk in our meadows! Every spring teams go out to see what’s going on in those 41 wooden boxes on poles that dot the Houston and Andorra Meadows. We’re in search of bluebirds, but there are a few other birds who show up. Every time we lift the hatch there’s a little mental drumroll. Ta-DAH. A twig! Some hopeful male bird is staking a claim. For every one of the boxes we jot down notes. 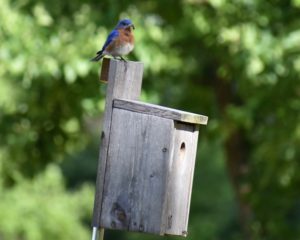 Lots of boxes remain empty all season, but a few of them will become homes for bluebirds, chickadees, tree swallows or tree sparrows, all birds that naturally like to nest in tree cavities. We go into the field armed with handouts showing us what nest each species builds and how its eggs look. Our big goal is the bluebirds, and for good reason. Bluebirds like big, open meadows. Insecticides over decades made life impossible for them around here. The healthy open land of the meadows, as well as setting up tempting nest boxes, has brought them back. The progress is glorious. Just one glimpse of a bluebird throws you into a Disney-esque reverie. The blue is brilliant, almost neon in the sunlight. The shape is outrageously cute. Slap a puffy dress on me and I’m Snow White and totally enchanted. Tree swallows are more abundant, and if you walk the meadows you’re sure to see them. They’re very dapper, with shiny blue-black backs and dazzling white bellies. They eye us suspiciously as we approach but are not inclined to dive-bomb us while we check the box. They perch nearby and swoop back down as soon as we leave. With a partner I trek through the meadows, prying open the lids and peeking in. This isn’t easy, since the boxes are above eye level. Fortunately, being a hoarder of free gifts from cosmetic companies, I have a mirror with a plastic folding lid. 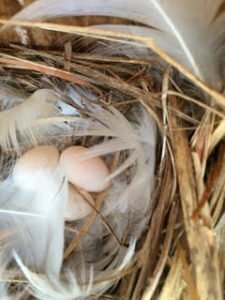 Holding the mirror’s lid just so, angling around, craning my neck, standing on tiptoe, I can sometimes see bird life unfolding: a beautifully constructed nest, a clutch of eggs, and one day, BINGO, a circle of fuzzy little heads. 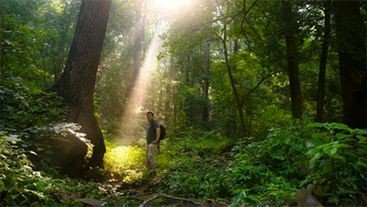 When monitoring bluebirds, I’m part of the process, part of their recovery. I’m also part of a team. A few years back, John Holback, FOW Field Operations Manager, did this job solo. Now about 30 of us are out there, having a great time and doing some good, clearing the way for more bluebirds in our future. 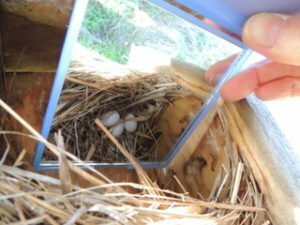 Holding up a mirror, we spy on a trio of swallow eggs. 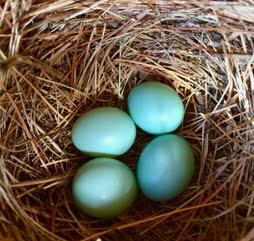 A phone is the only way to get a shot of these beautiful bluebird eggs. Tree swallows often line their nests with feathers. Daddy Bluebird is just back from a food run with something juicy in his beak. 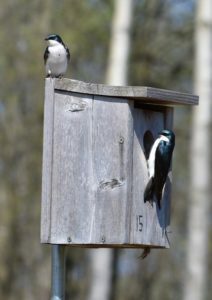 A pair of tree swallows keep close watch on their nest. 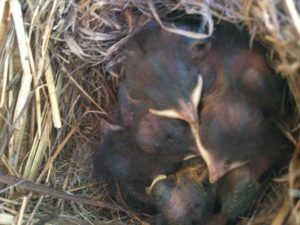 Bluebird hatchlings, just a few days old, huddle together.